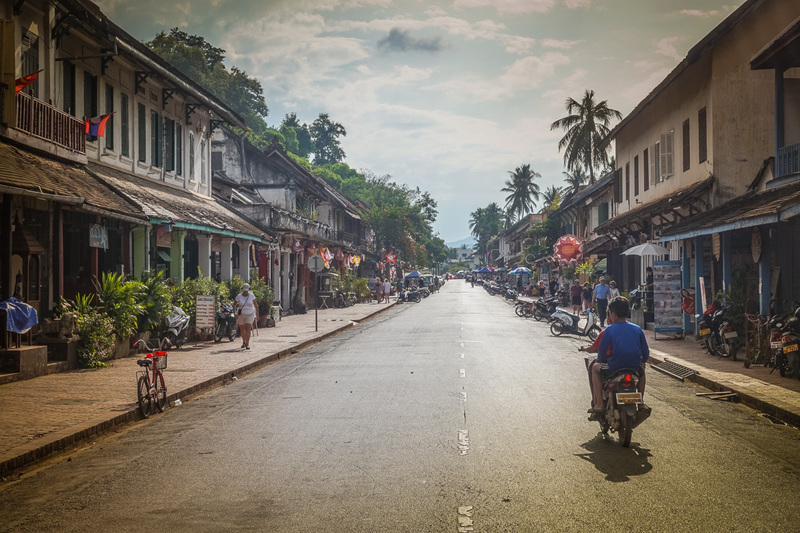 Luang Prabang, a UNESCO World Heritage Site is a popular destination for any backpacker travelling through Laos in Asia and can be reached via bus in 12 hours from the capital Vientiane. Book your transport here. 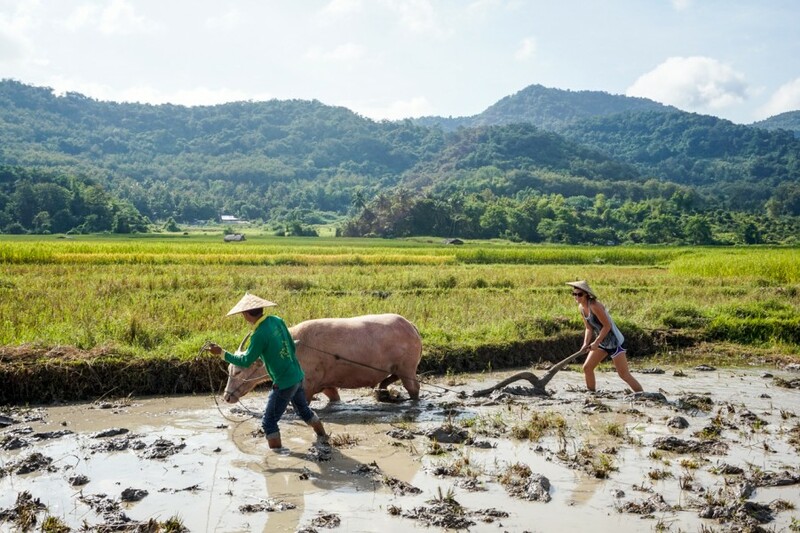 The town running alongside the Mekong and Nam Khan River is full of markets, cafes, guest houses, museums & temples. The streets are clean and the architecture resembles that of a quaint European village with a lot of charm, history and culture. For such a small town, there’s enough to keep you busy for at least a few days! 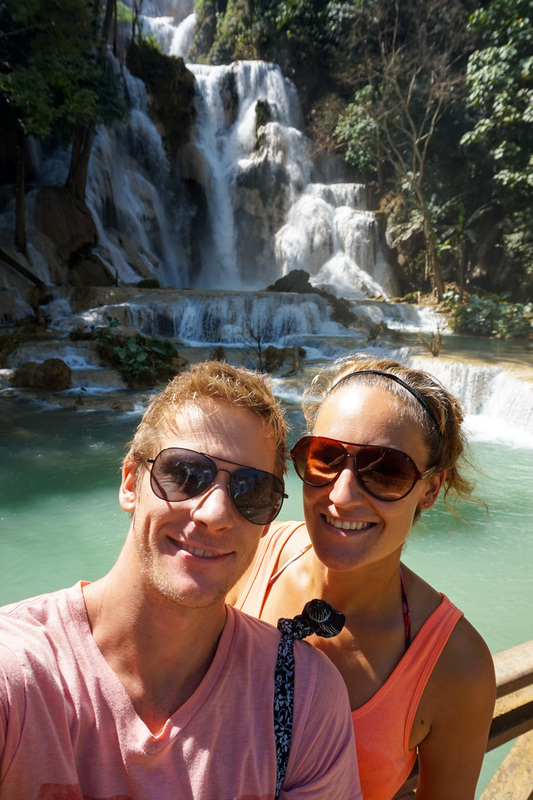 This was our favourite town in Laos and we spent 5 days exploring the city and surrounding areas. 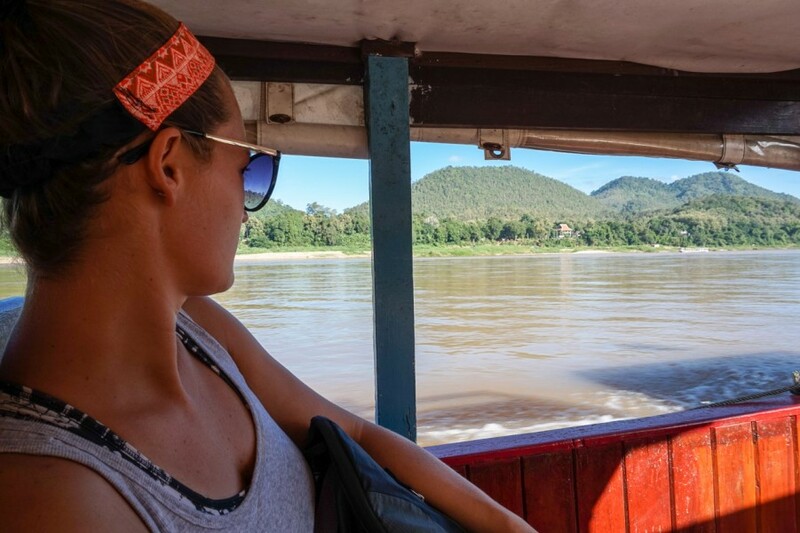 Here are the best things to do in Luang Prabang, Laos. We’ve been to Niagara Falls (Canada), Victoria Falls (Zimbabwe & Zambia) and Iguazu Falls (Argentina & Brazil). Wow, that’s a lot of falls! 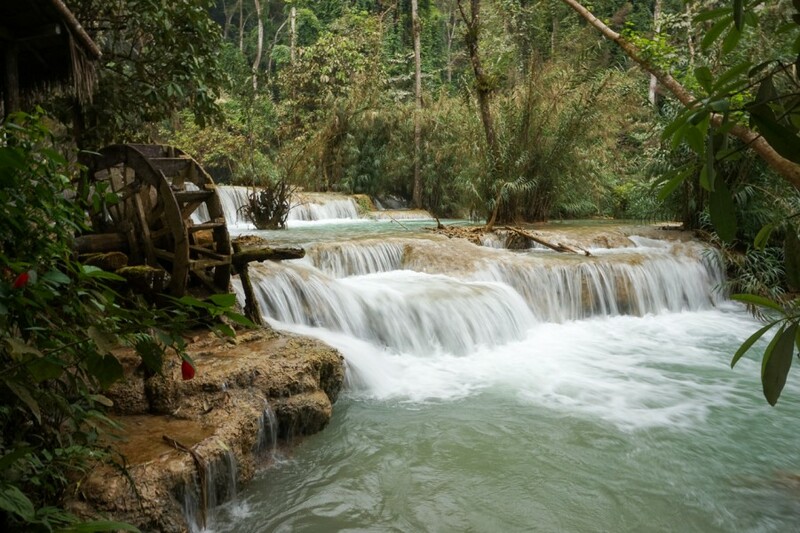 Whilst they are all seriously impressive, the Kuang Si Falls in Laos was something else. 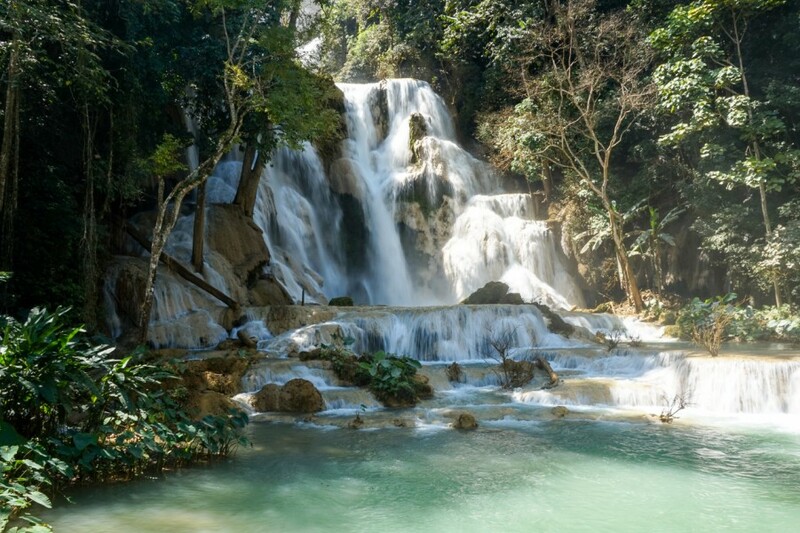 These falls are much more serene and calm in nature, making for an entirely different experience especially when you see them all cascade. 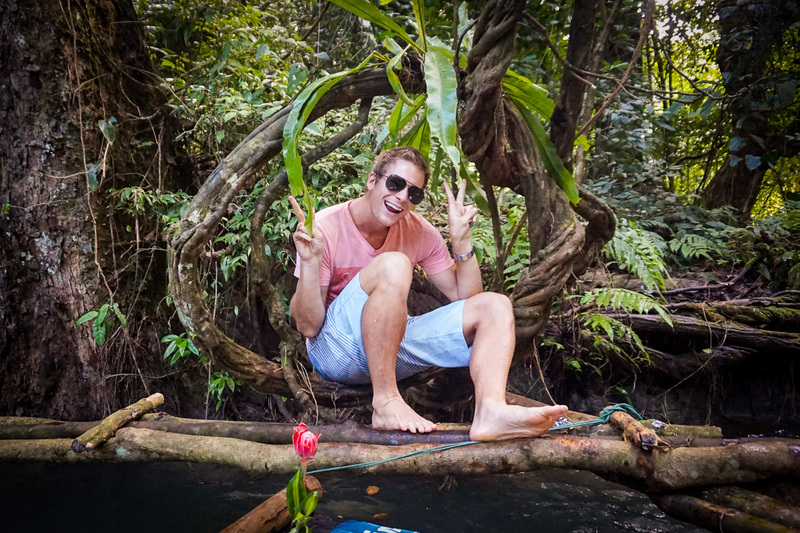 Bonus, you can even swim in them! 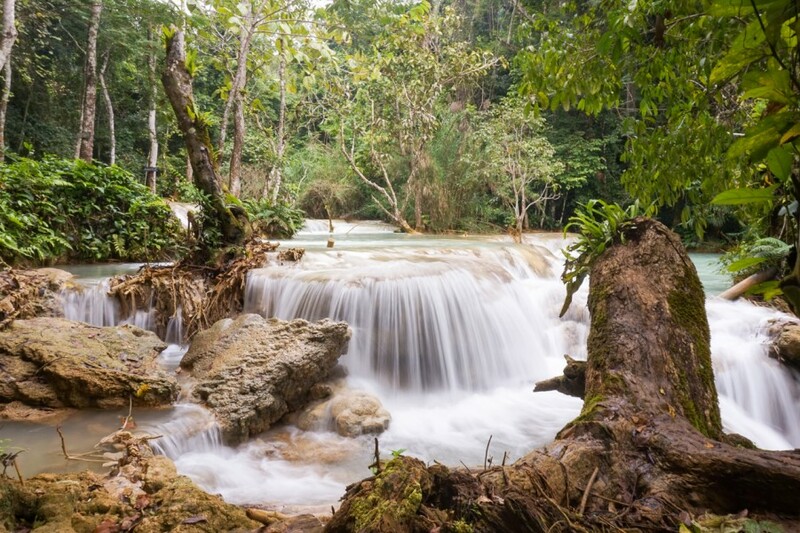 Located just 21km out of the city centre, you can reach the waterfalls in an hour by mini-van, tuk-tuk or motorbike. 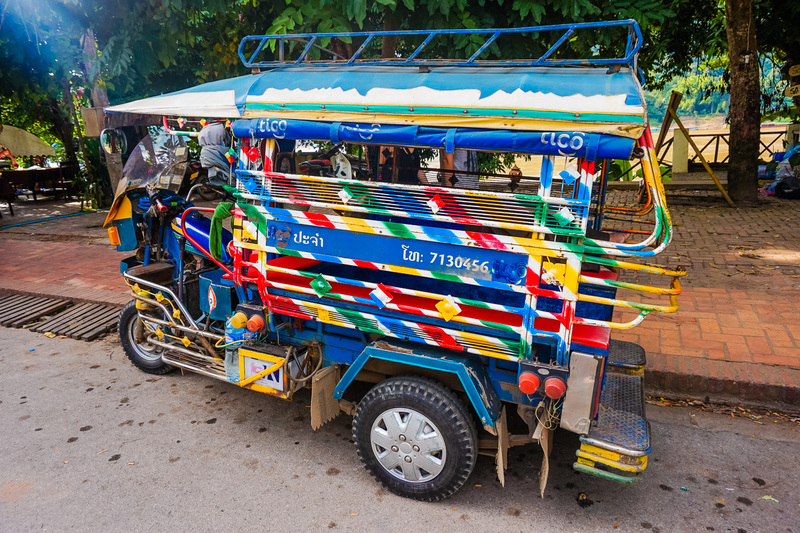 If you have a group of 6, we recommend a tuk-tuk. 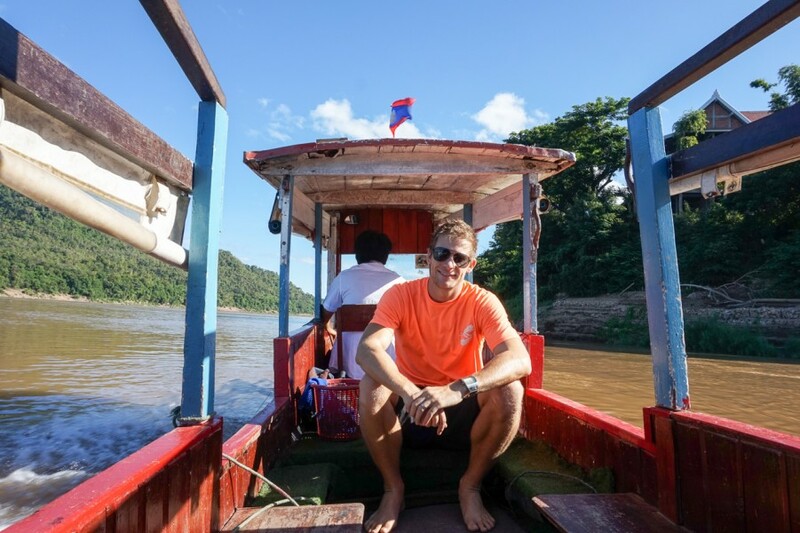 It will cost between 30,000 – 40,000 kip ($3.50 – $5 USD) per person, for the round trip transfer. 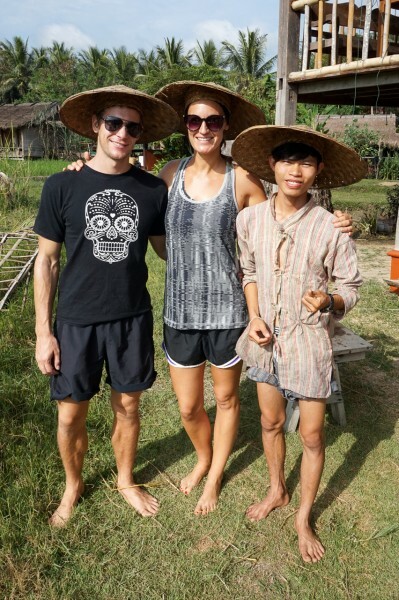 The tuk-tuk driver will wait for you until you are ready to leave, but it is a good idea to let them know a time. Get there early (9am). 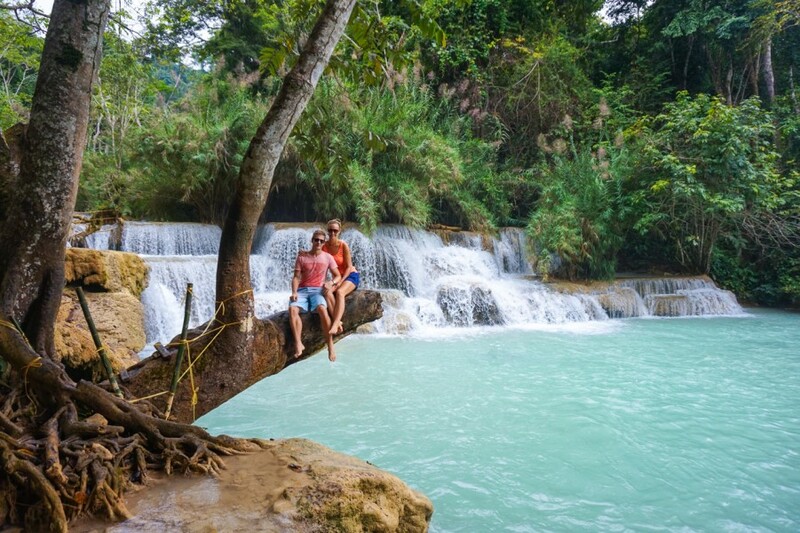 It is the most visited attraction in Luang Prabang and the earlier you arrive, the more you have to yourself and who wants other people in your photos? 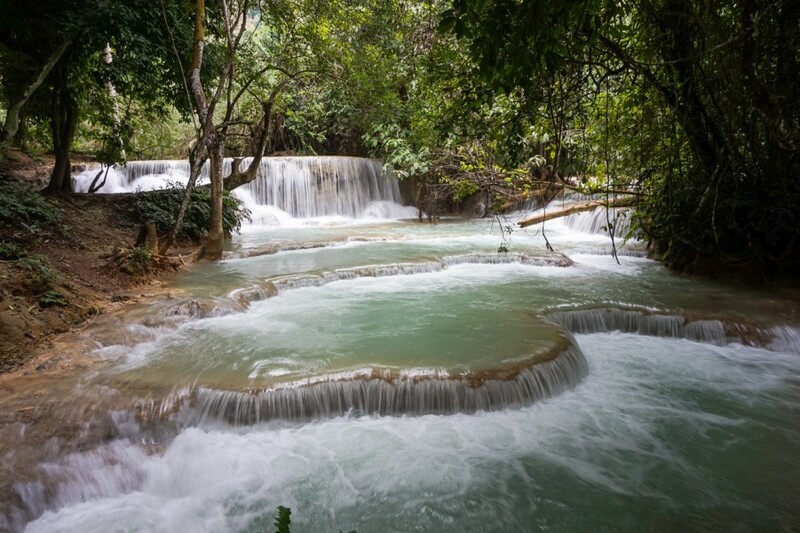 Don’t settle on the first pool, walk to the very back of the falls and up the stairs on either the left or right. 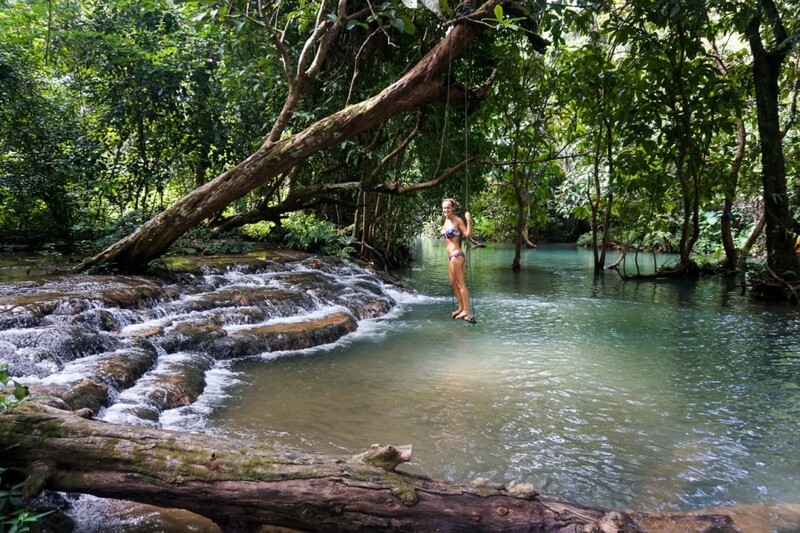 Once at the top, you have views of the falls below and ‘secret’ pools to swim in and swings to swing on. No one else was there when our group went up and it was awesome to have the place to ourselves. By the time we got down at 12pm, the bottom of the falls was swarming with tourists which took away the serenity. 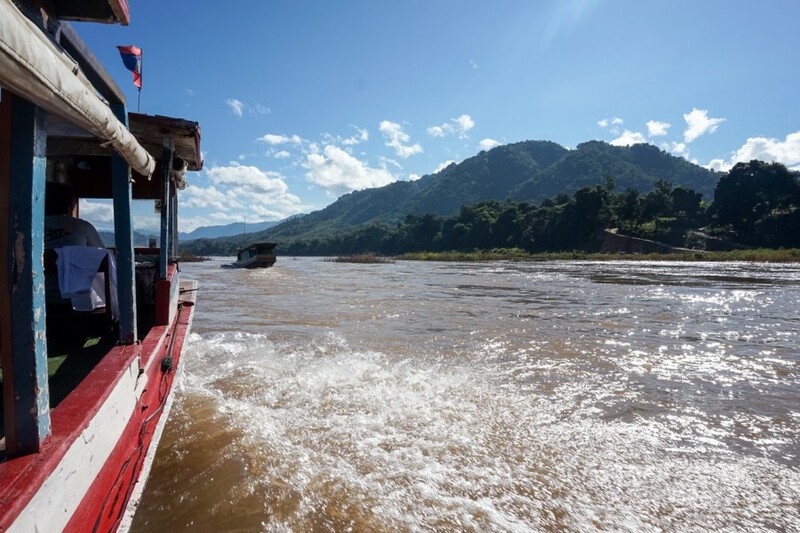 If the slow boat from Huay Xai to Luang Prabang is too long (2 days) for you, but you still want to experience life on the Mekong River then take this half day trip to the Pak Ou Caves. 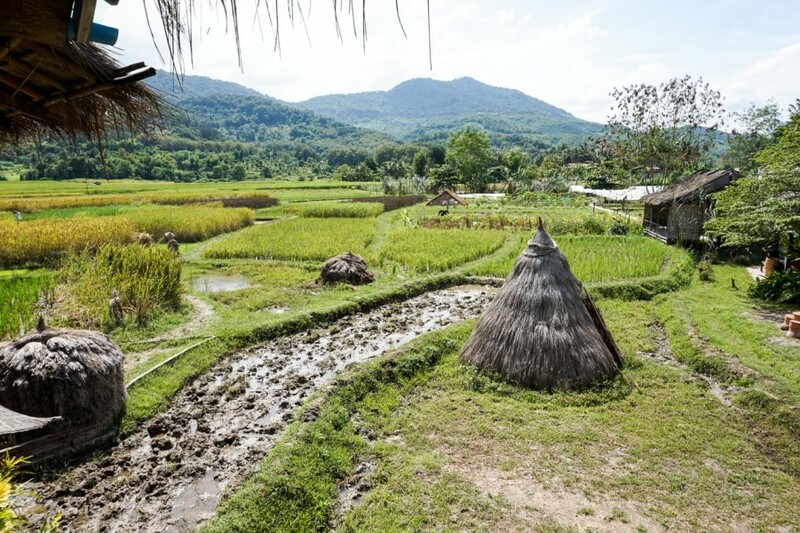 On the way, you will also visit the somewhat lack luster, Lao Lao village to sample the local Laos rice whisky. The riverboats are quite basic but they work! 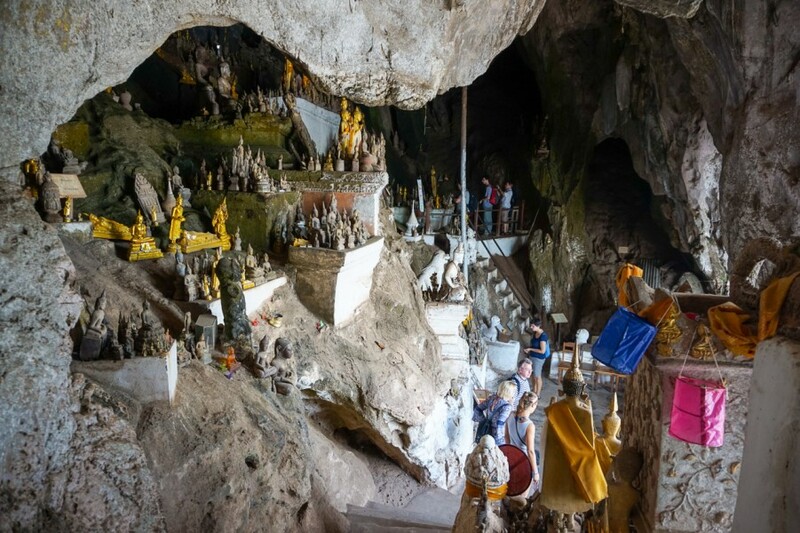 The Pak Ou Caves are limestone caves filled with thousands of Buddha images in varying sizes and styles. 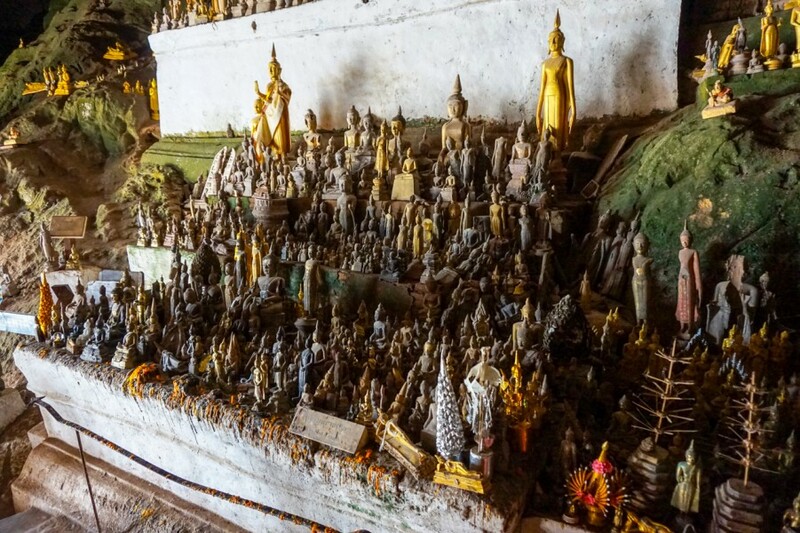 There are 2 caves to visit with one a short climb up some stairs. 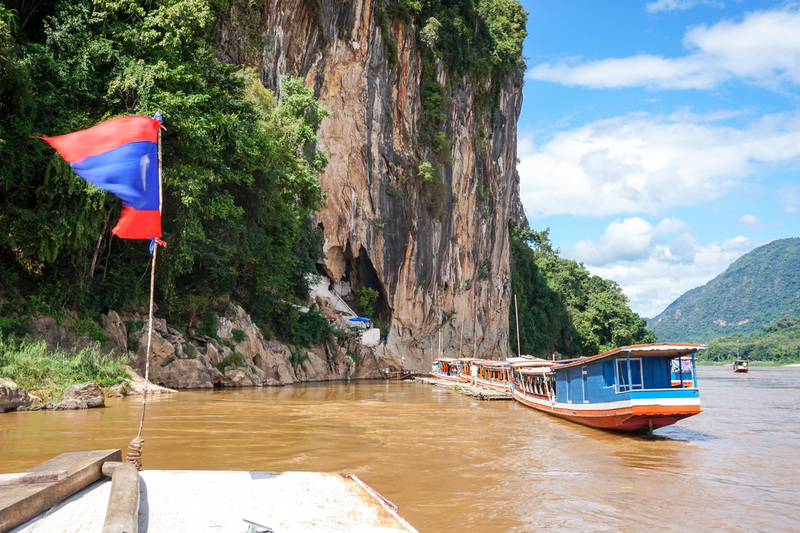 To be honest, the caves were a little bit underwhelming but we enjoyed the boat ride on the Mekong River! 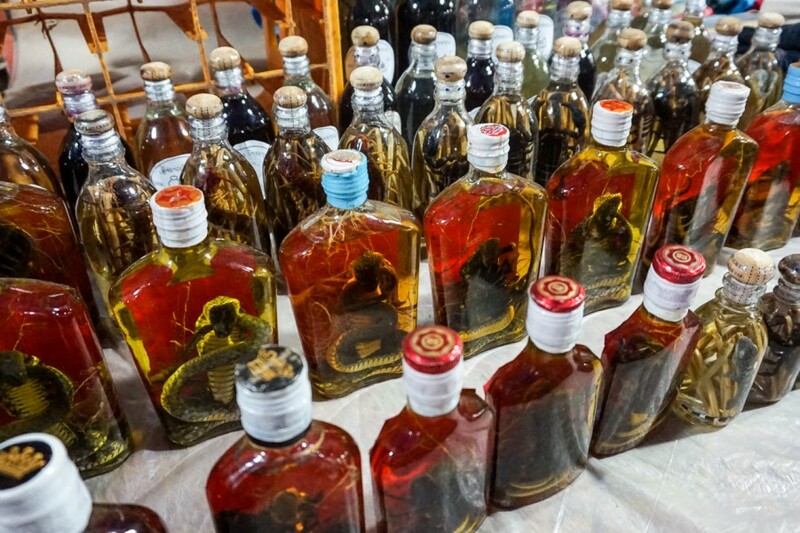 Lao Lao whisky is 40% alcohol and claims to be the cheapest alcohol in the world. 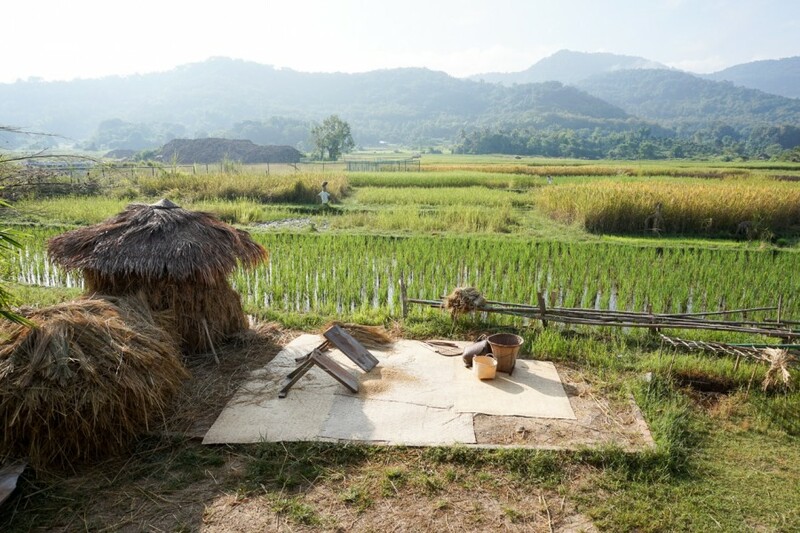 This particular whisky is made by steamed distillation using hulls of sticky rice and crumbles of yeast balls. Ew. It was not our favourite drink of choice and we tried it in 2 flavours, banana-infused and honey ginger. Both of which tasted like petrol. 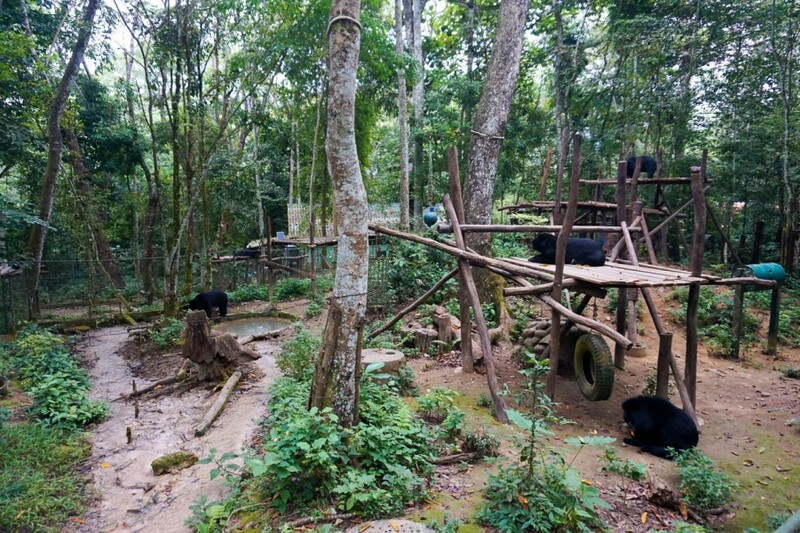 Cost 65,000 kip ($8 USD) + 20,000 kip ($3 USD) for cave entry. The boats depart at 8:30 am but arrive at the dock by 8:00 am to purchase a ticket. 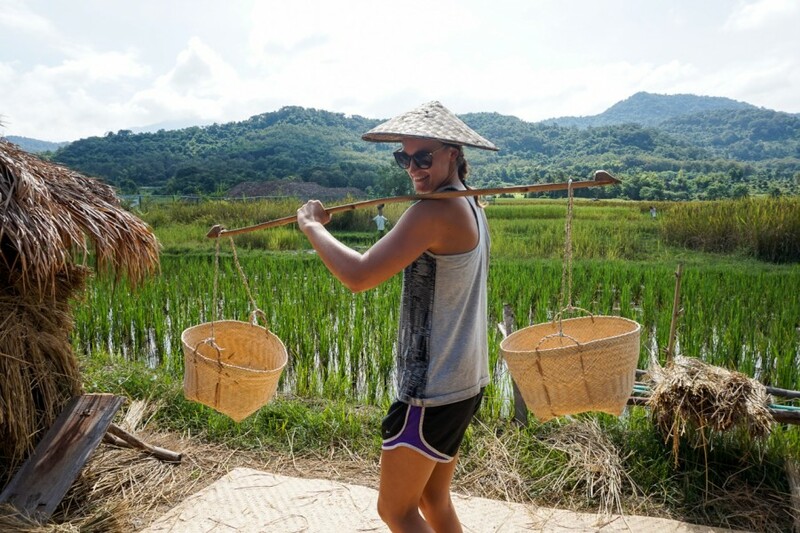 Spending half a day at the Living Land Farm was by far our favourite activity to do in Luang Prabang and we strongly recommend it! 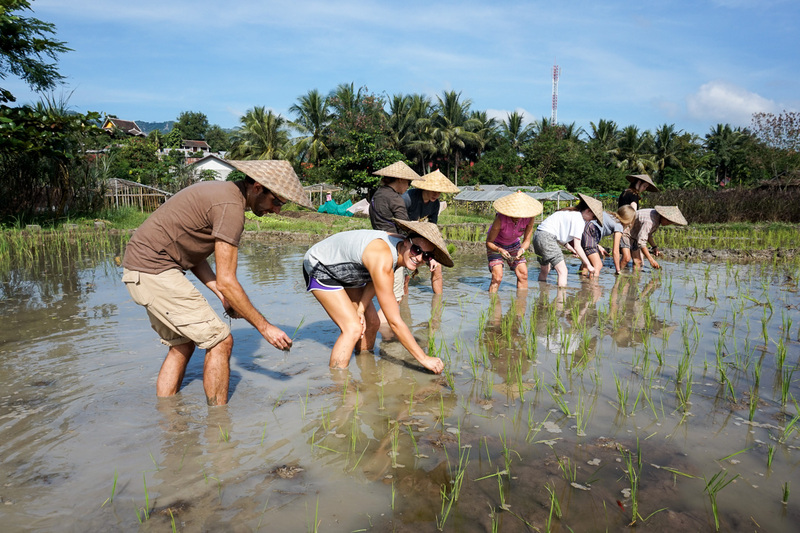 7 families work on this farm, producing sticky rice on 8000 hectares of land. 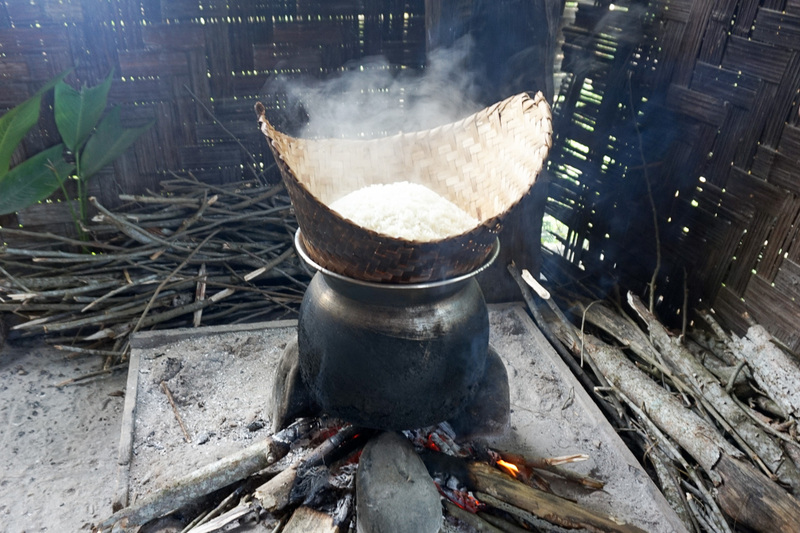 They don’t sell this rice to outside sources, it is only grown and eaten in the surrounding villages. 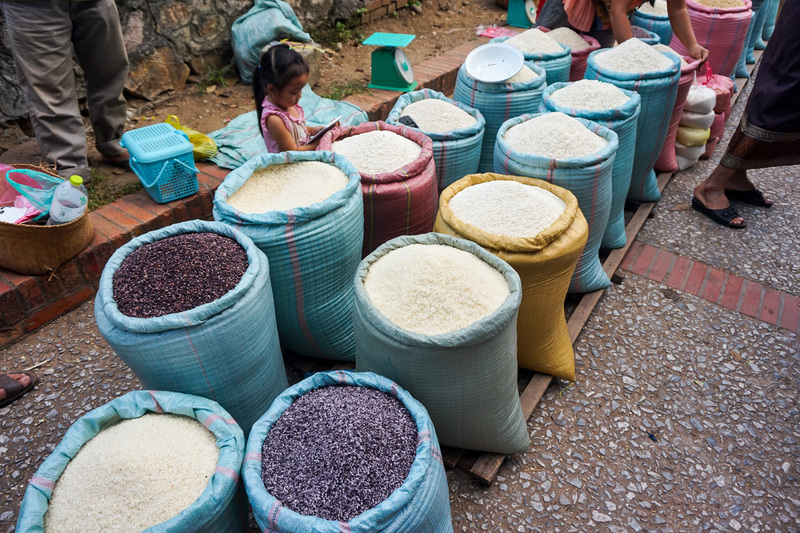 Sticky rice has long been a staple in Asian culture, but there is little appreciation for the work that goes into getting the rice on your plate every day. 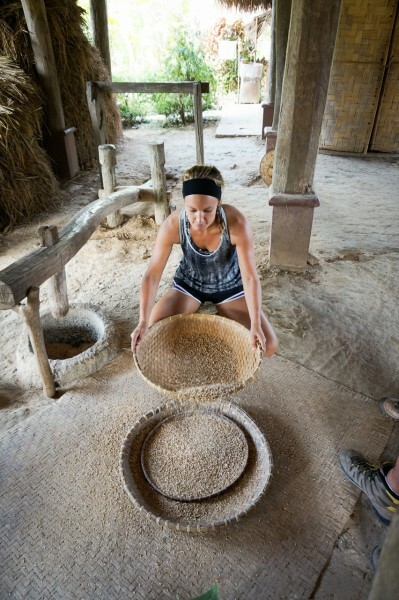 We sure had no idea the steps of this lengthy process. The 4-hour tour is comprehensive and shows you the steps from the beginning to the end. All 14 of them! 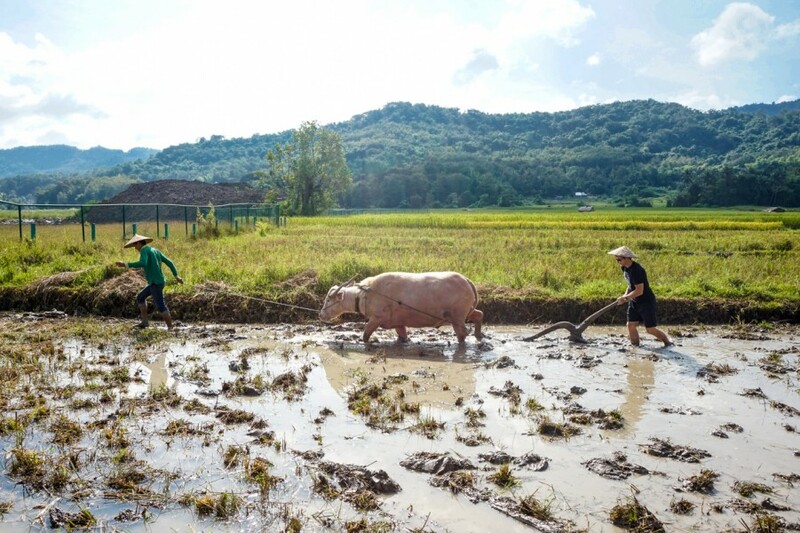 Ploughing with a water buffalo to planting, harvesting, threshing, grinding & winnowing. We did it all. 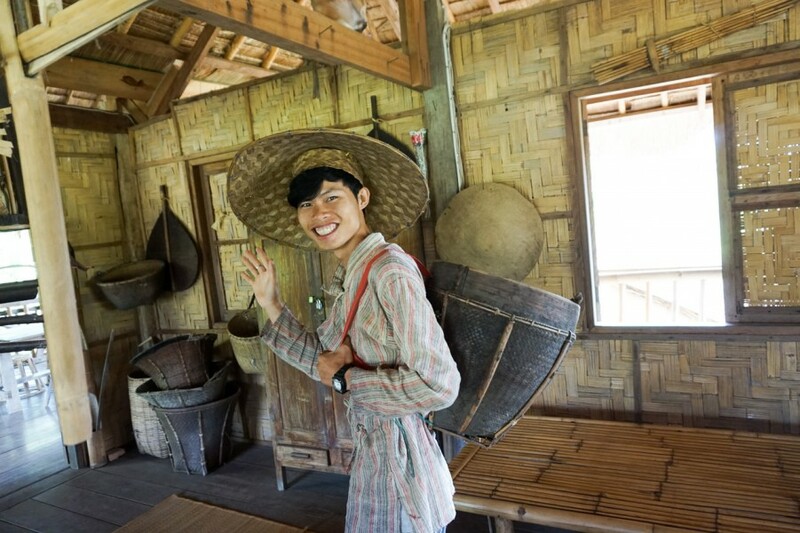 It was such a hands-on experience and our guide was hilarious. 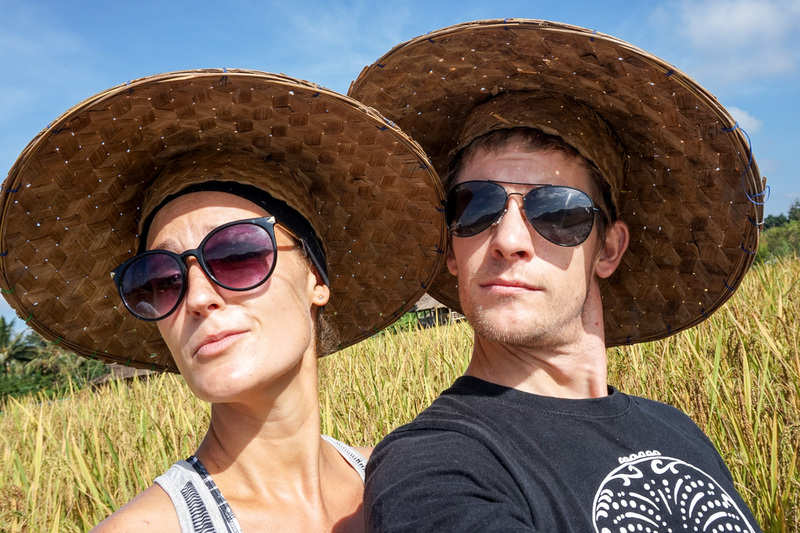 We vow to never waste a grain of rice again, nor do we feel the same about eating rice in general. The cuisine in Laos is not as well known as its neighbouring countries due to it being landlocked. 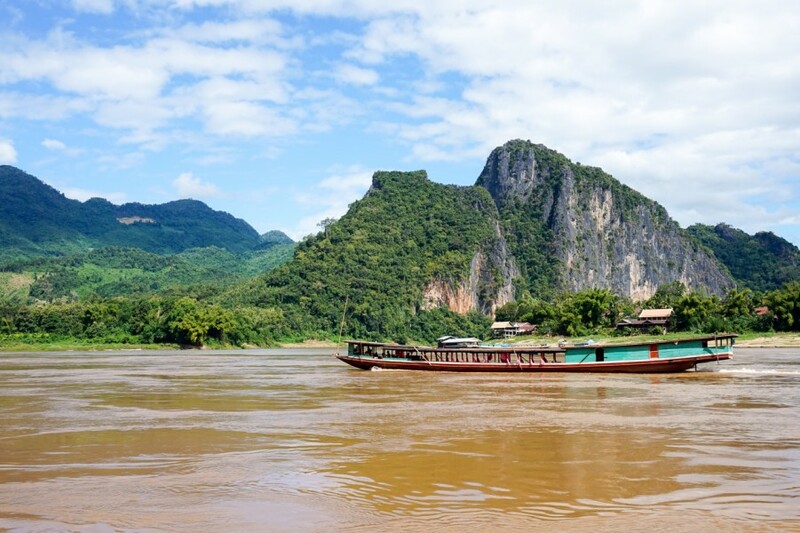 Laos cuisine is a combination of Thai, Vietnamese, French flavours and of course, local flavours. 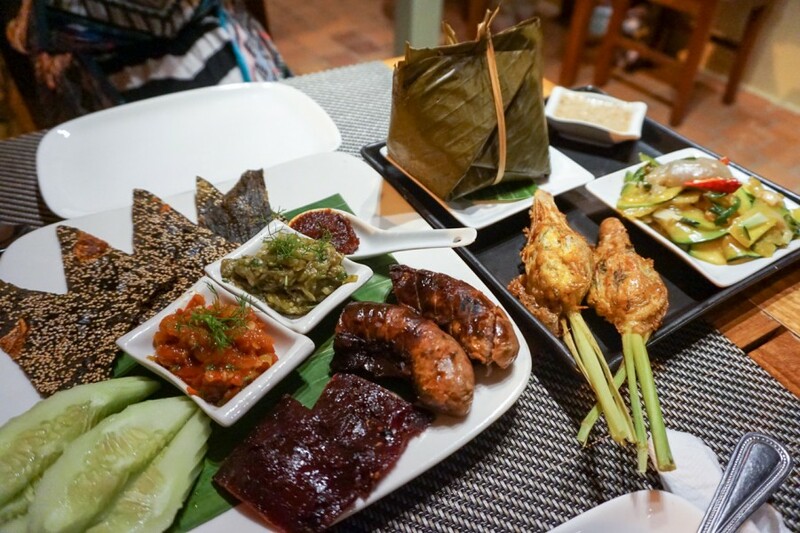 Tamarind is one of Luang Prabang’s most famous restaurants due to the availability to sample almost every local Laos dish. 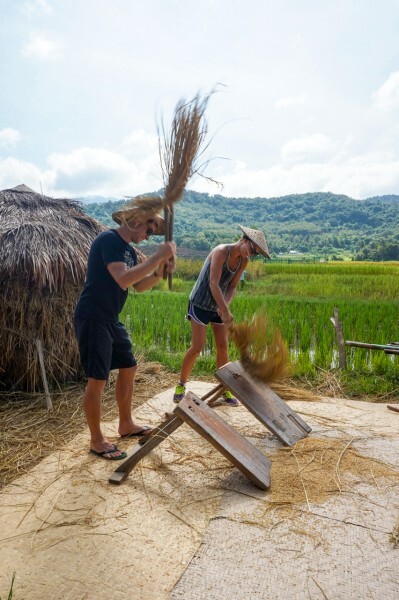 They have a variety of tasting menus ranging from 70,000 to 440,000 kip and it will give you a taste of what Laos cuisine is all about. Chunky bamboo and vegetable soup, which we didn’t like as it was way too earthy. 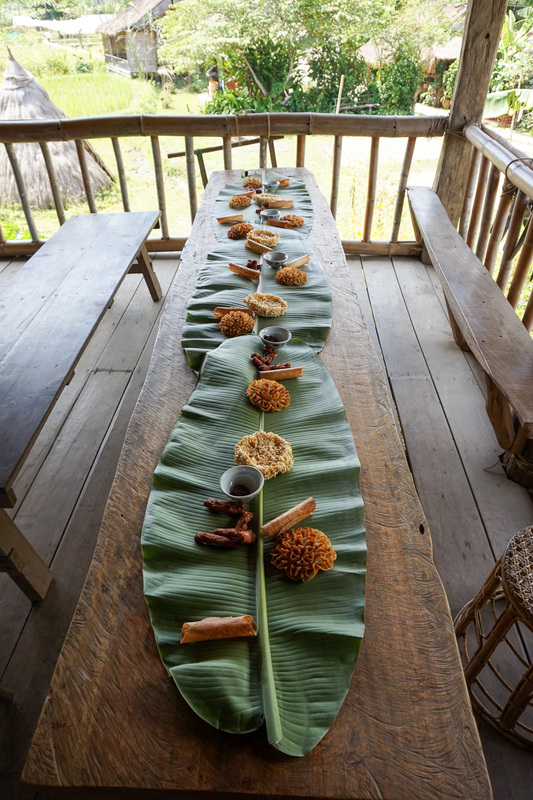 Platter of Lao specialities; Luang Prabang sausage, relishes, jeow (dips) and sticky rice. 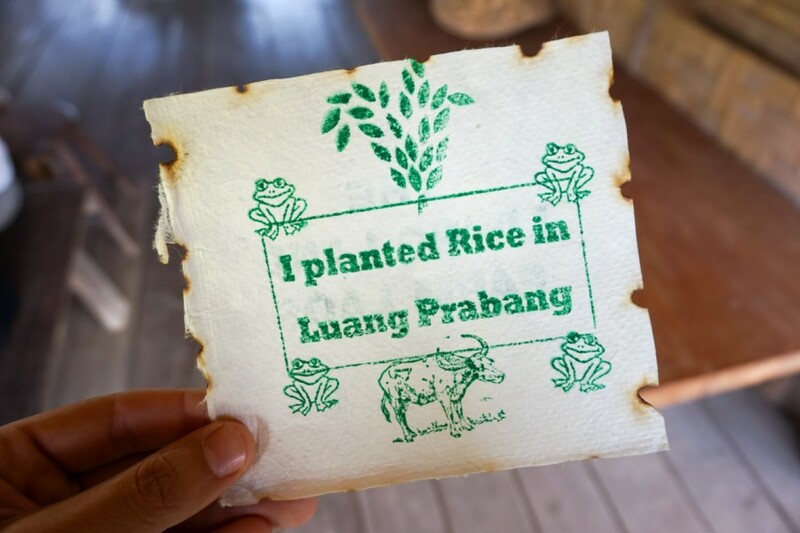 Herb fish steamed in banana leaf – our favourite! Fragrant lemongrass stuffed with chicken – yum! Purple sticky rice dessert in coconut milk with tamarind sauce + local biscuits made from palm sugar and puffed rice. 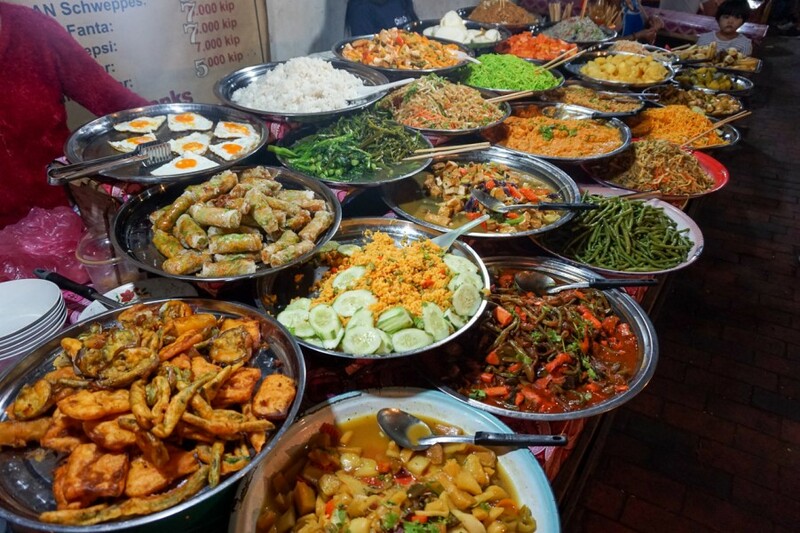 For a full list of Laos dishes to try, check out this post. It will make you hungry! 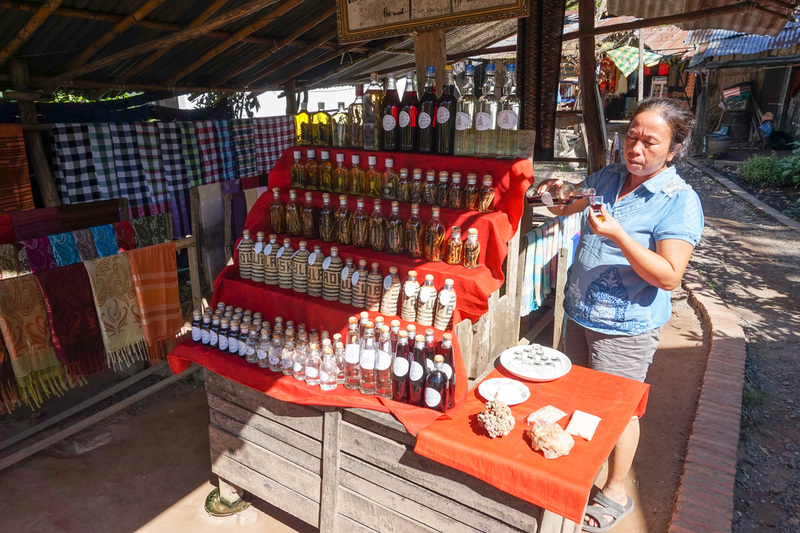 Markets are a popular occurrence in every Asian country and Laos is no exception. 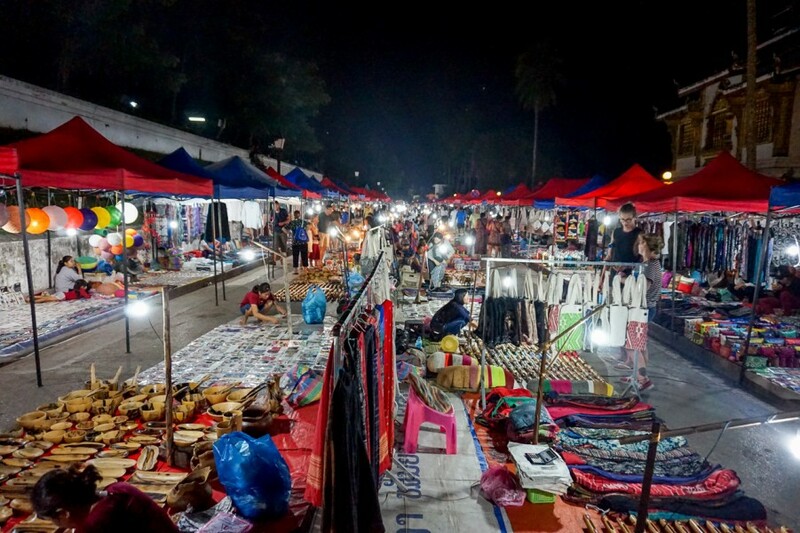 In Luang Prabang, they have both night and morning markets. 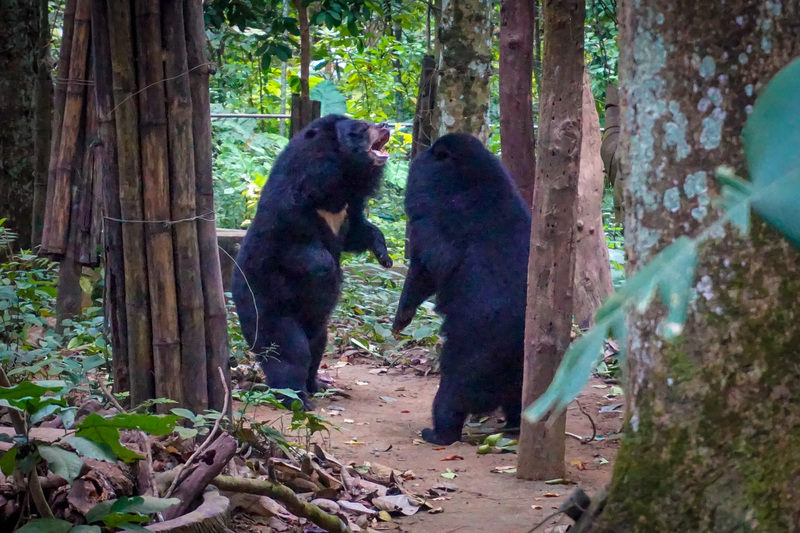 Sure they’re a little bit touristic but they are also enjoyable for an early morning or evening stroll. 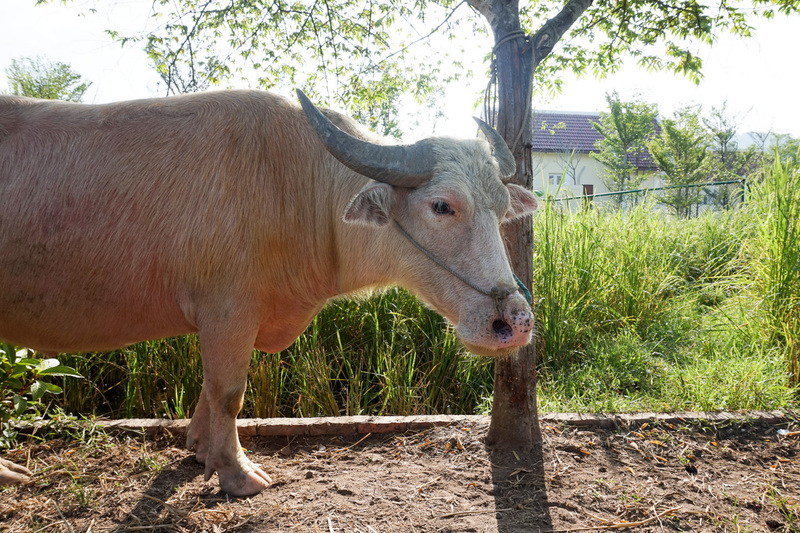 The morning markets begin at 6:00 am and bring all sorts of interesting creatures. 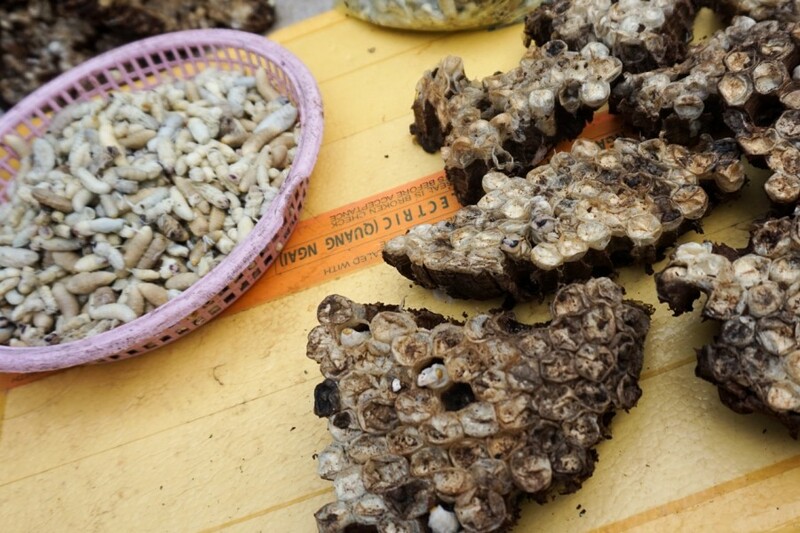 Maggots for breakfast anyone? It’s quite peaceful in the morning and the crowds are smaller. 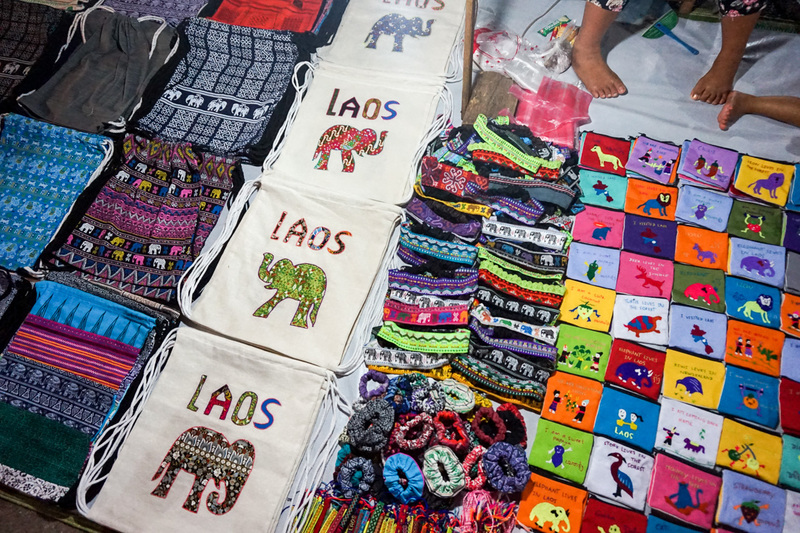 Every night the night markets set up shop along Sisavangvong Road & sell colourful souvenirs, art, silverware, clothes & food. 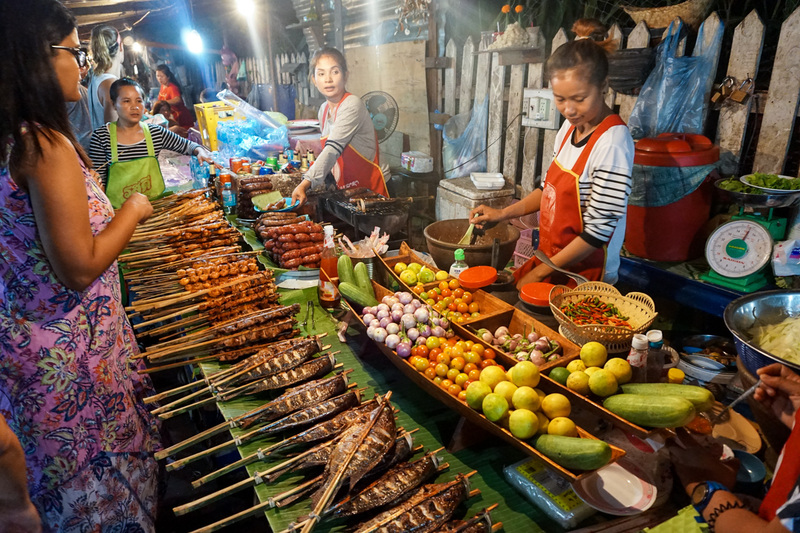 The food choices down the side alleys are endless and awfully cheap! 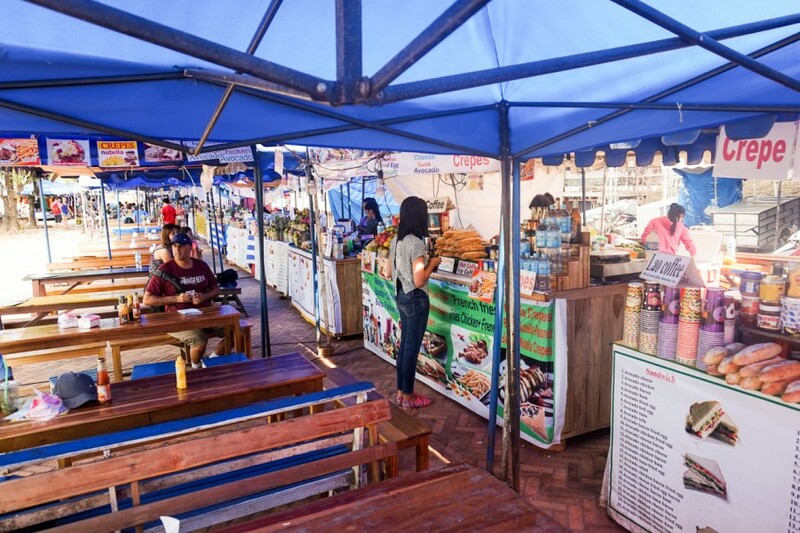 Many food vendors set up camp with juice, noodle, sandwiches, BBQ & soups stalls. 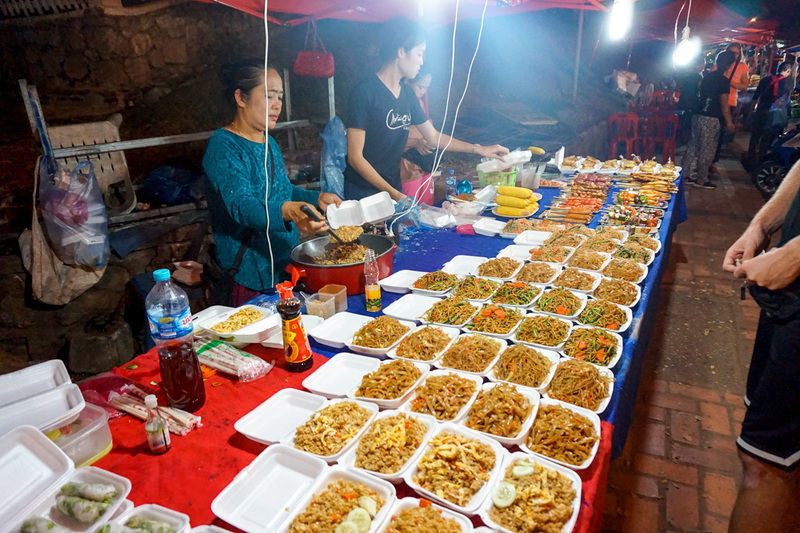 For a cheap, fulfilling meal, The Vegetarian Buffet (shown above) down the street at the Wat Mai corner is a very budget choice for dinner. 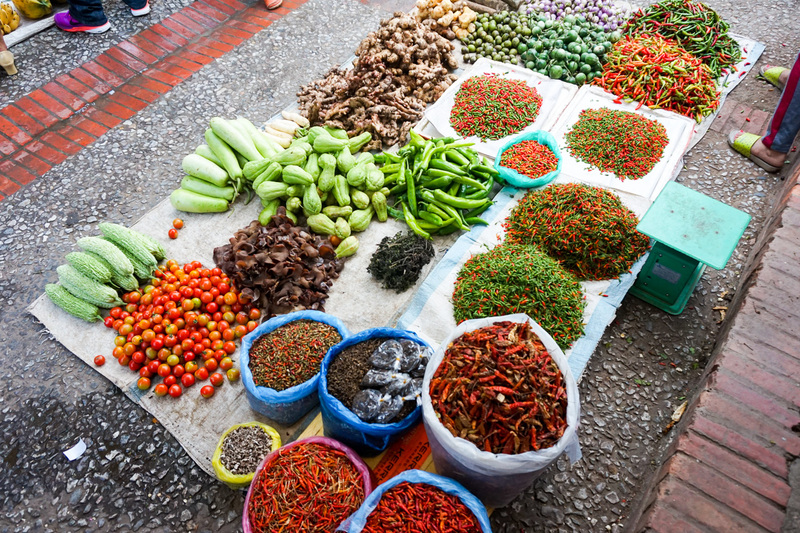 Fill up your plate up with a range of vegetarian options for 10,000-15,000 kip ($1.25- $2.00 USD). 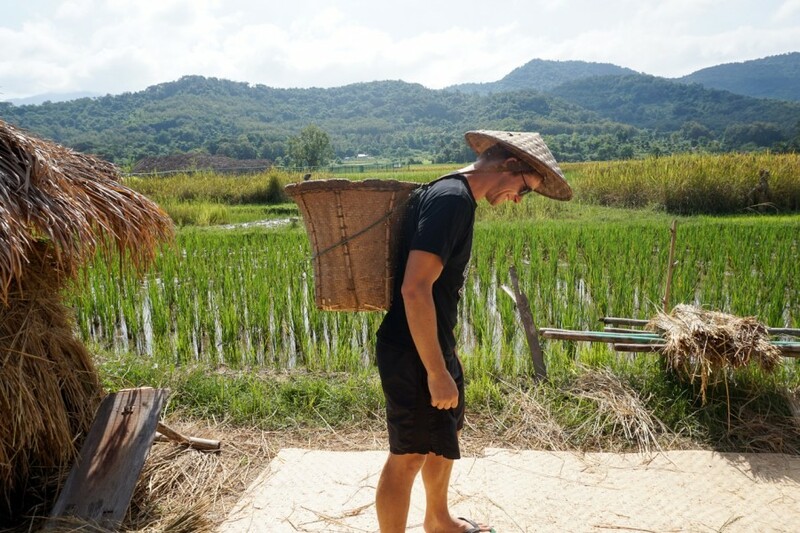 We utilized this budget meal more than once and ate a whole fish and a bowl of vegetables for $5. Do note, the buffet is high in MSG. 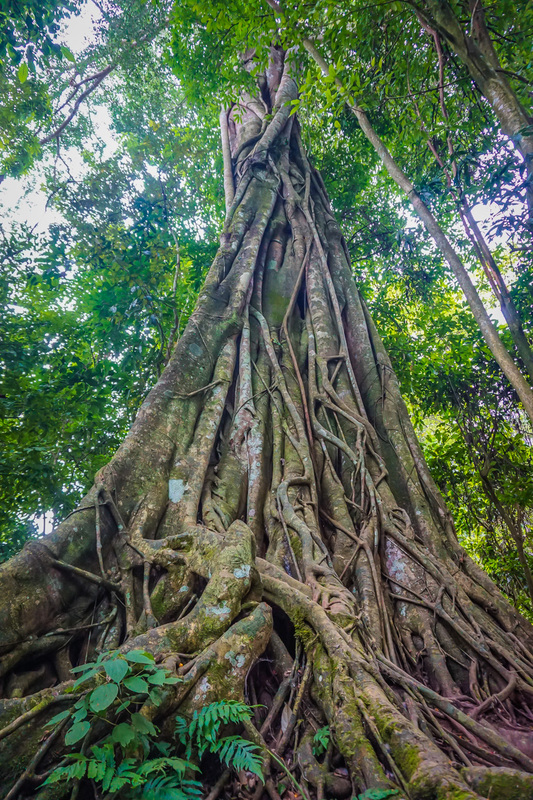 We’ve noticed 2 things while on our travels… Every city has a monument that is a pole and every city has a hill you can climb up. 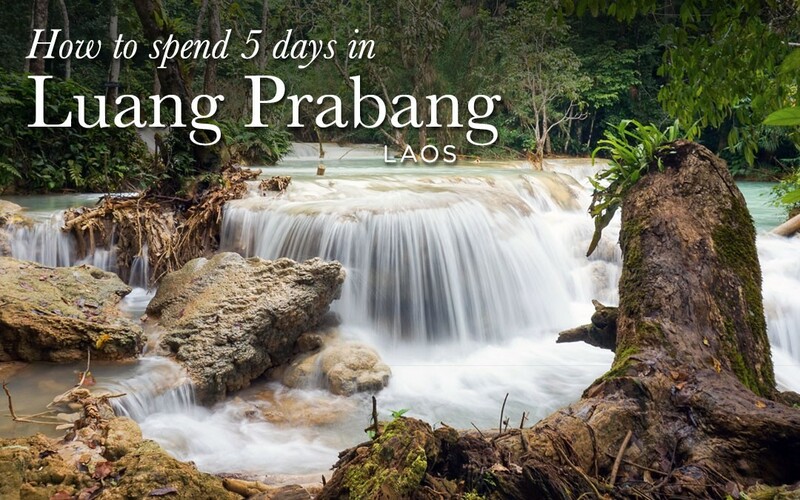 Luang Prabang is no exception. 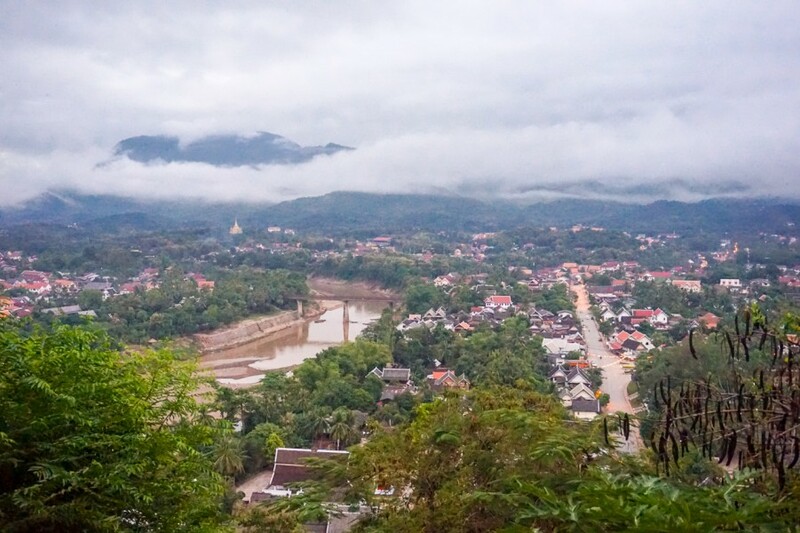 We arrived at 4:30 am from our overnight bus from Huay Xai so we headed to the top of Mount Phou Si Hill located in the centre of the city to catch the sunrise… or not. Of course, the morning was overcast, so our sunrise was a little disappointing! Either way, it was a decent 360 view of the city below. 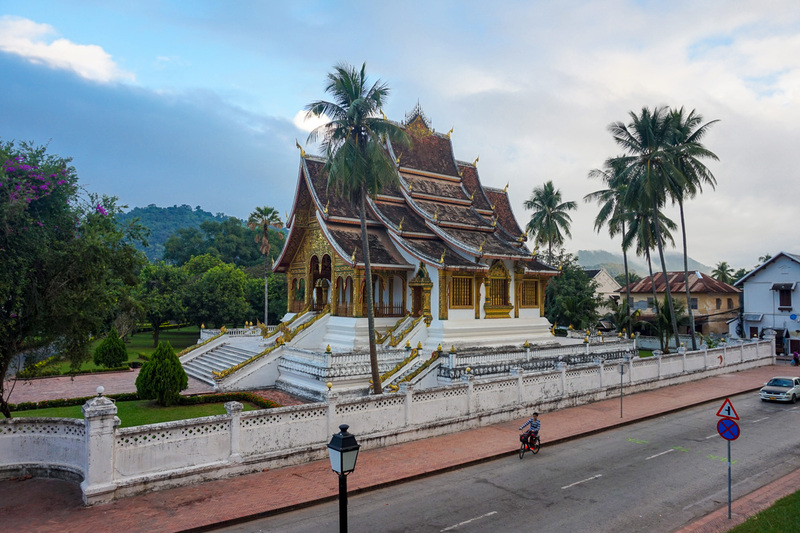 Head to the Royal Palace Museum if you’re interested in learning more about the history and culture of Laos. 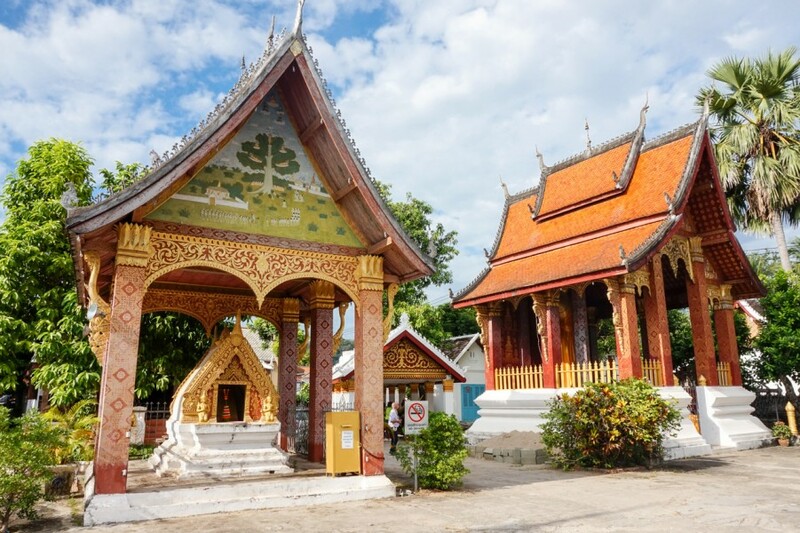 The palace was built in 1909 during the French colonisation to house King Sisavang Vong and the royal family. Since 1975 it has become a museum. Inside, the royal apartments have been faithfully preserved and they offer a fascinating glimpse into the lifestyle of the king and his family. 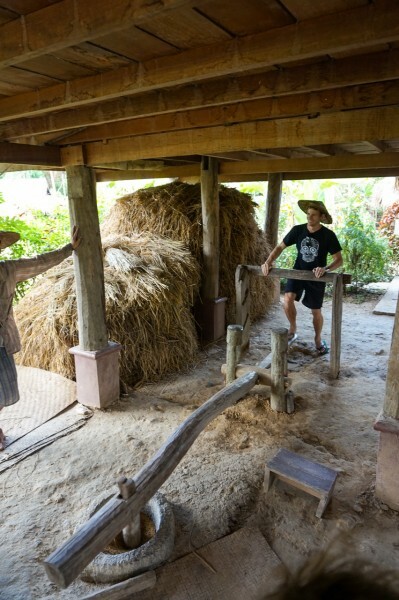 There are no signs or explanations inside so it is best visited with a guide. Opening Times : 8:00 to 11:30am and 1:30 to 4:00pm every day except Tuesday. Laos was part of French Indochina for about 60 years, so with this French influence, baguettes have become a part of the Laos diet. You can find them on almost every street corner and for dirt cheap. 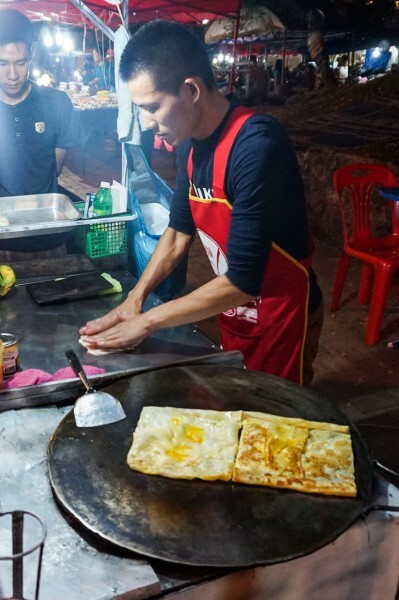 The most popular baguettes in Laos are called Khao Jee and are filled with lettuce, sliced tomatoes, carrot, onion and optional cheese, pork, and topped with pâté, mayonnaise and a sweet chilli sauce. These sandwiches cost 10,000 – 15,000 kip ($1.50 USD). Super tasty! For western style baguettes, there is 10-15 food stands set up every day along Sisavangvong Road that sells sandwiches all day starting at 10,000 – 20,000 kip ($1.25 USD – $2.50 USD ) and fresh juices for 10,000 – 15,000 kip. 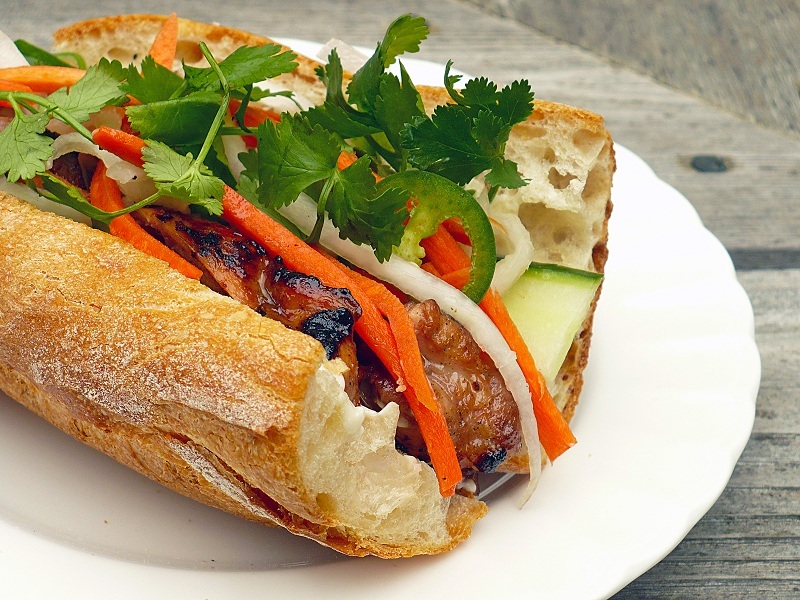 So if you need a quick, cheap lunch in Laos, look no further than a baguette. Be wary of the chicken, it sits out in the heat all day. 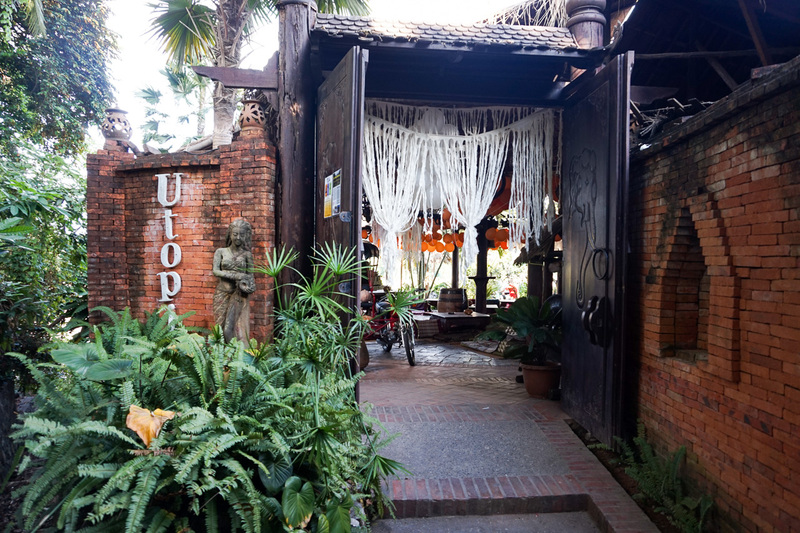 Utopia is a multi-purpose bar and relax haven. 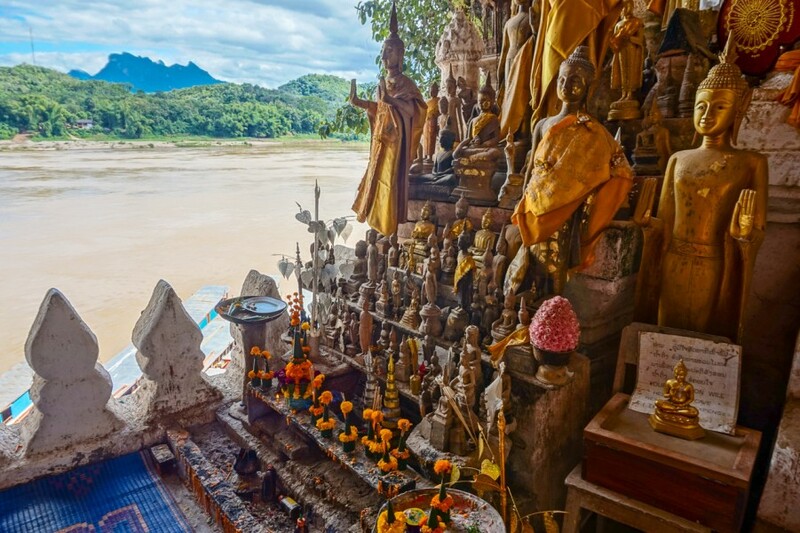 In the mornings, take a yoga class for $5 USD on the porch overlooking the river. By day, you have ample space to read a book, eat lunch or play beach volleyball. 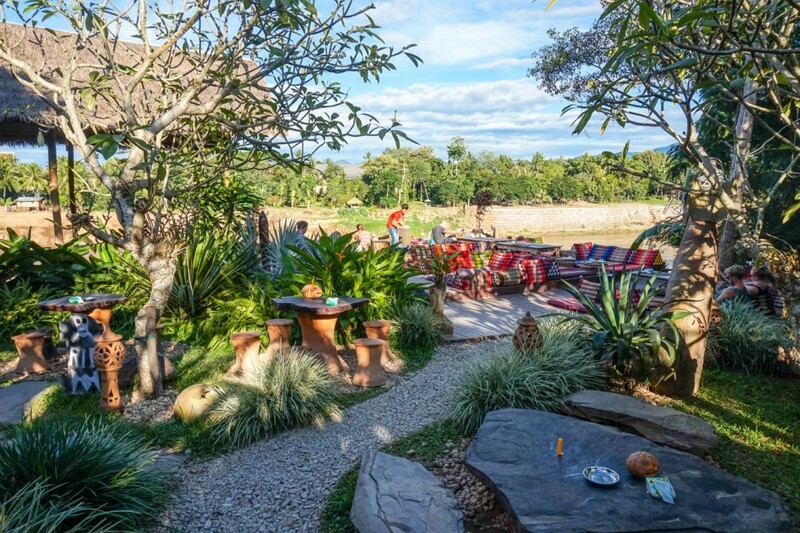 By night, this is the place to be to sip a cocktail as the sun goes down, grab dinner, smoke shisha and listen to music. 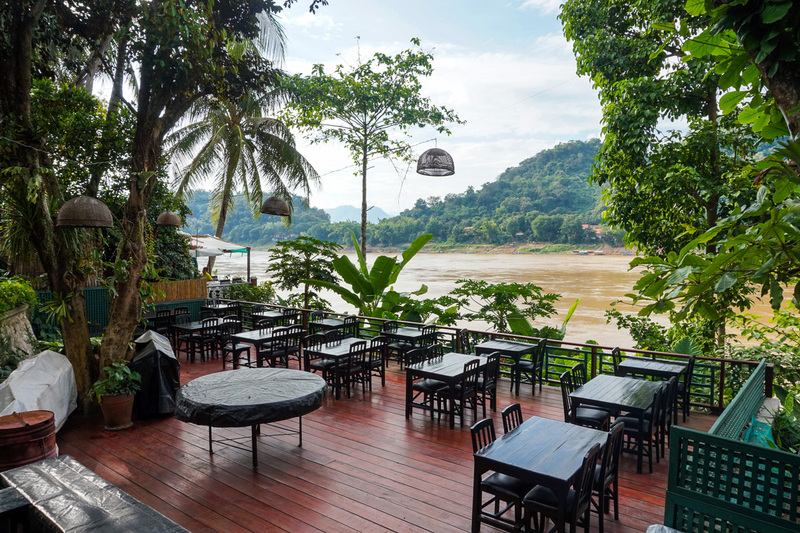 This is the busiest bar in Luang Prabang and is open from 7am – midnight. Ok, this isn’t the most cultural activity in Luang Prabang but it’s important to discuss a place to avoid the heat. 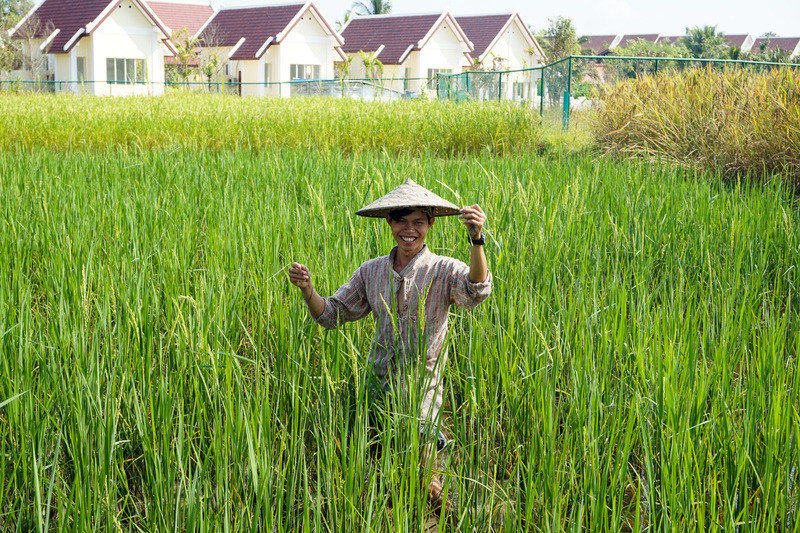 During the dry months, it is HOT in this town and there isn’t a lot to do to cool off. 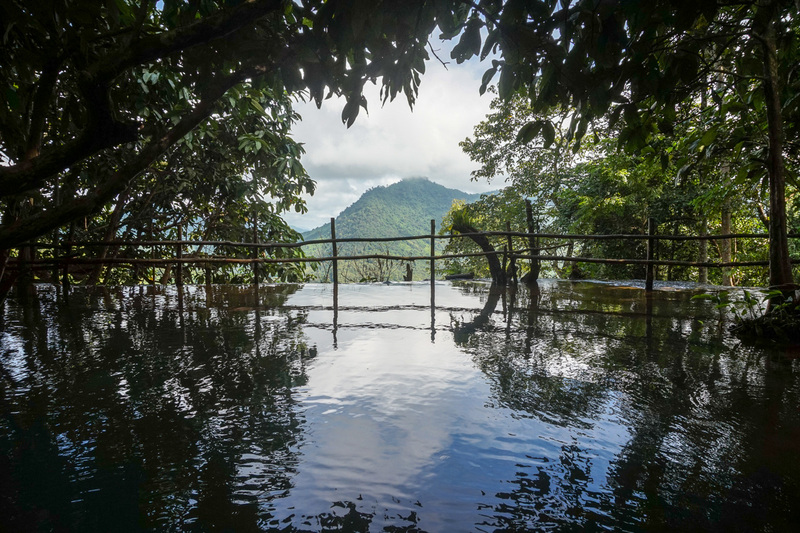 La Pistoche has 3 sized pools, a swim-up bar and a restaurant. 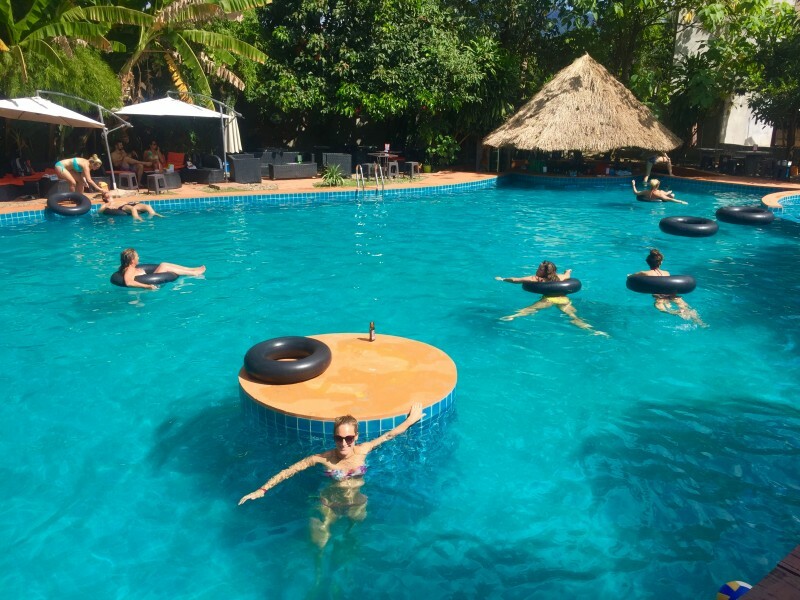 For just 30,000 kip ($3.50 USD) you can spend all day in the pool and enjoy happy hour 2-for-1 drinks between 12 pm – 7 pm. It is the perfect city escape if your hotel doesn’t have its own pool. 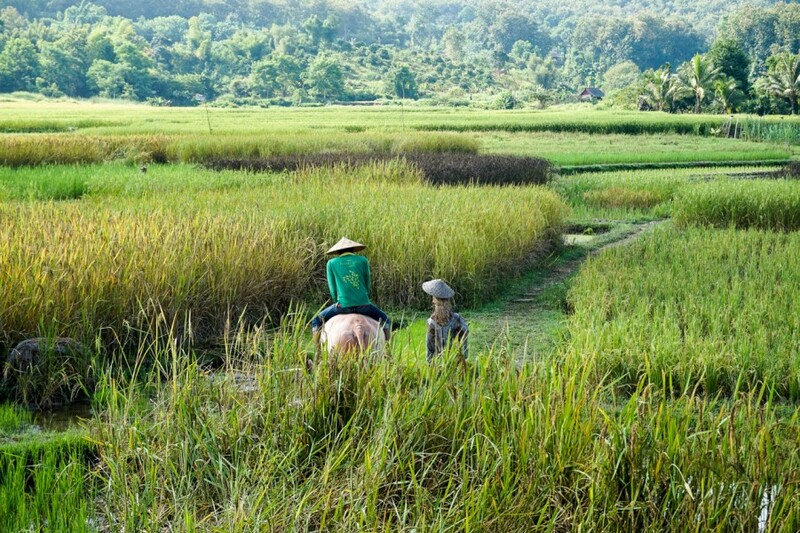 It is used by both locals and foreigners. 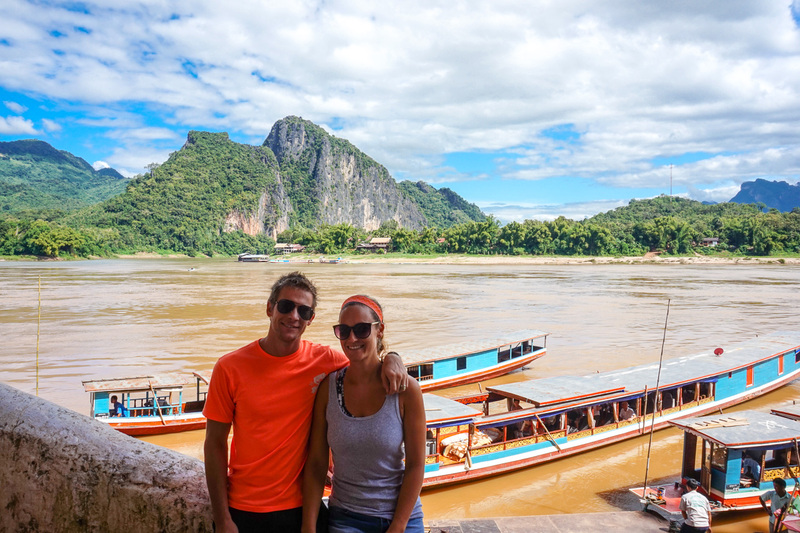 Where to stay in Luang Prabang? 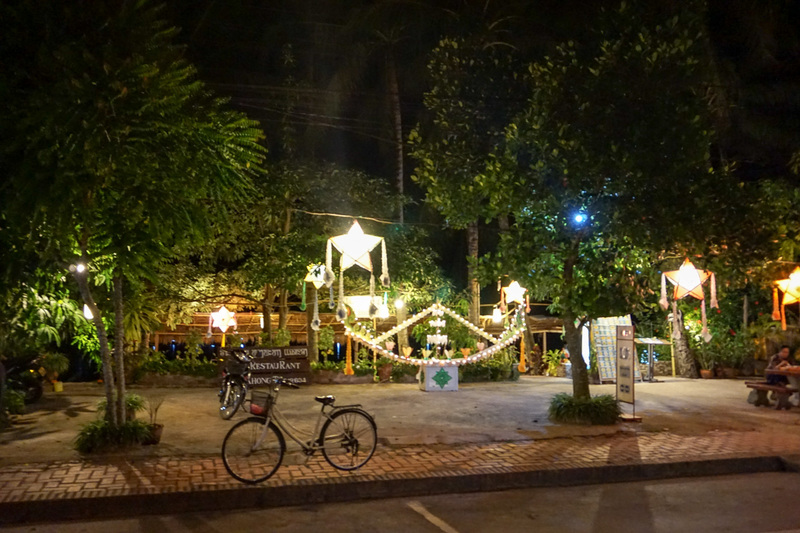 Guesthouses are endless in this little town! You’re spoilt for choice. 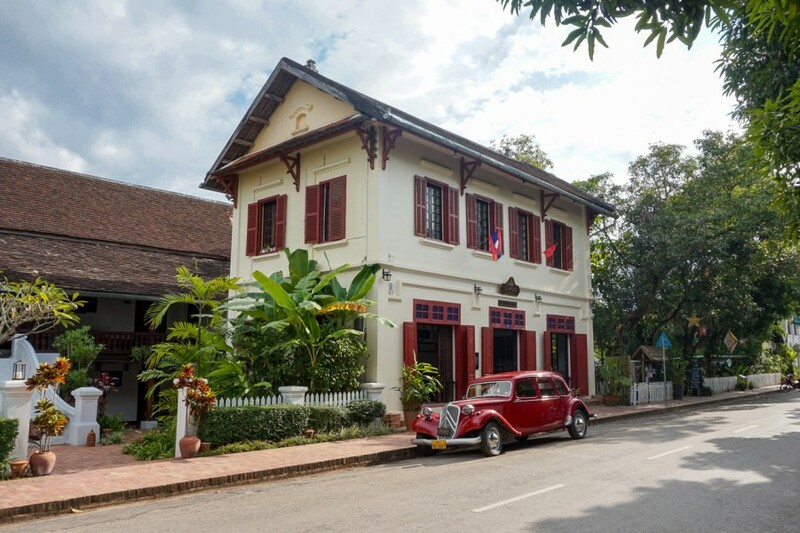 We loved our hotel in Luang Prabang, in fact, it was one of our favourites so far in Asia. Lakangthong 2 Friendly Guest House had the BEST breakfast (perhaps why we liked it so much), fast WiFi, very clean rooms, modern furniture, the most comfortable bed & it was a 5-10 minute walk from all you needed. 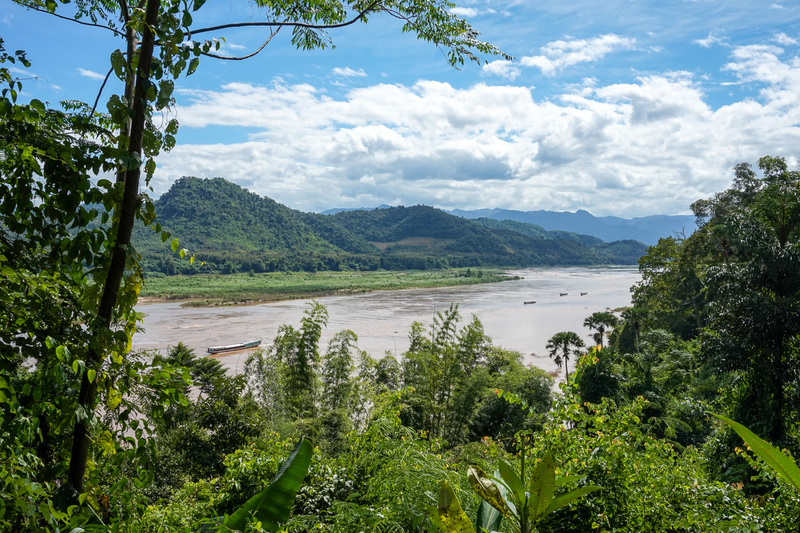 If you prefer somewhere on the Mekong River, View Khemkhong Guest House is a riverfront hotel with many restaurants located close by. Unfortunately, breakfast wasn’t included here but the location was perfect. 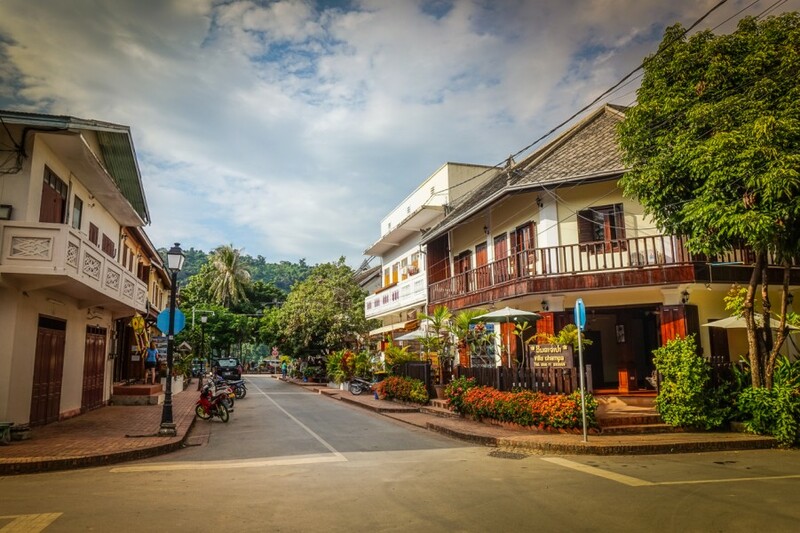 View Hotels in Luang Prabang. 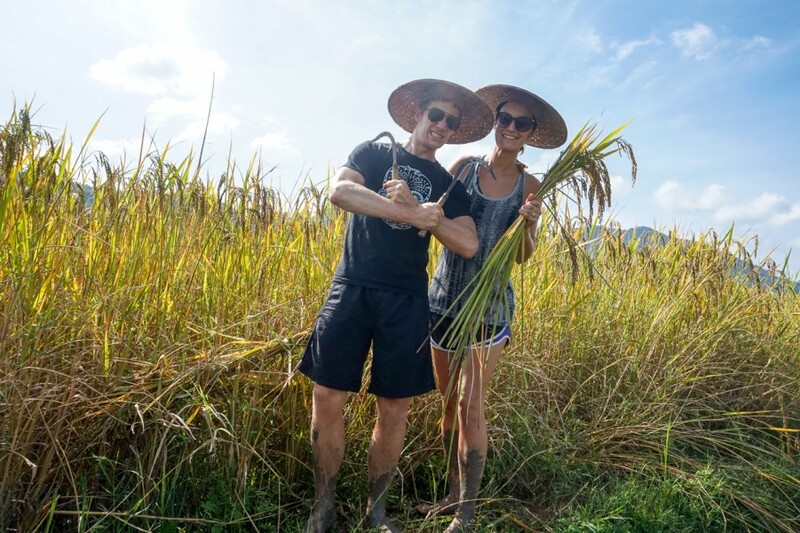 Our next Laos adventure brings us to Vang Vieng to go tubing! This scene has changed dramatically over the last 5 years so we are keen to see what it’s like these days… Stay tuned, we’ll let you know!